Brunei, a small nation on the island of Borneo, will begin enforcing death by stoning for citizens who are proven to be a part of the LGBT community, starting April 3, a Thursday Deadline guest column by actor George Clooney read. This extreme implementation of Sharia is fronted by the Sultan of Brunei, Hassanal Bolkiah. The 72-year-old, who also serves as the nation's prime minister, mandates the hands or feet of convicted thieves to be amputated. The law was first introduced in 2014. 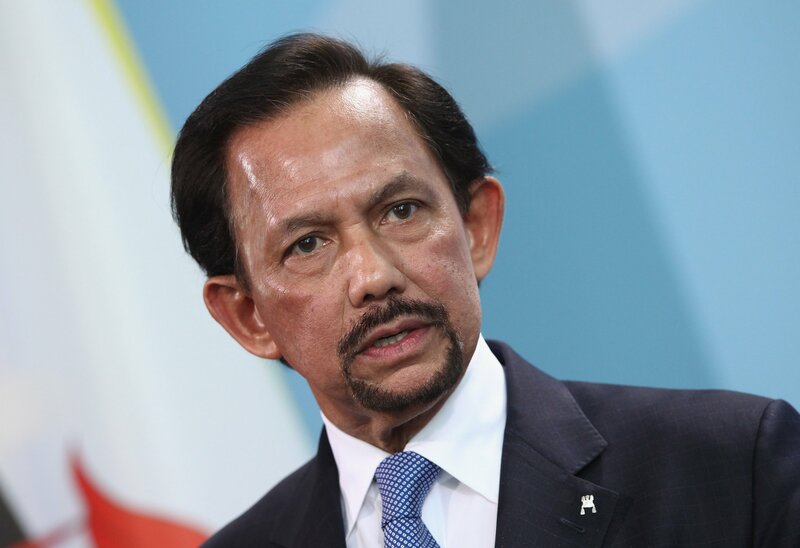 In announcing the stoning for being gay, Brunei’s government website quoted the Sultan as saying his government "does not expect other people to accept and agree with it, but that it would suffice if they just respect the nation in the same way that it also respects them." Human rights groups were quick to identify the laws were "cruel," "inhumane" and "degrading." "Brunei must immediately halt its plans to implement these vicious punishments and revise its Penal Code in compliance with its human rights obligations. The international community must urgently condemn Brunei's move to put these cruel penalties into practice," Rachel Chhoa-Howard, Brunei Researcher at Amnesty International, said in a statement. Bolkiah has acted as Brunei's Sultan since 1967. He is known for regaining the nation's independence from the United Kingdom in 1984. Bolkiah has been married to three women, having two wives consecutively twice throughout his life. Pengiran Anak Saleha, Bolkiah's first wife, has been married to the sultan since 1965. He was married to Isteri Mariam from 1982 to 2003 and Azrinaz Mazhar Hakim from 2005 to 2010. The sultan is not only the second-longest reigning current monarch, next to Queen Elizabeth II, but also is one of the wealthiest in the world—with a net worth of around $20 billion, according to Forbes. Bolkiah has the largest Rolls-Royce collection, with around 500 cars. His most beloved is a Rolls Royce Phantom VI, which was custom-made with a slanting rear that aids aerodynamics and has scissor doors, costs around $600,000, according to Economic Times. The total worth of his car collection is said to be around $4 billion. Along with his 500 luxury vehicles, the Sultan also owns and operates Brunei Investment Agency. The agency, in turn, owns nine luxurious hotels across the globe. Clooney called for a boycott of all nine hotels, while also disclosing that he had stayed at many of them because he "hadn’t done [his] homework and didn’t know who owned them."